Criminal justice reform, while necessary on many levels, is destined to have a disproportionate impact on retail. Rising felony thresholds are expanding what constitutes misdemeanor theft and a large majority of misdemeanor theft comes in the form of shoplifting—hence the disproportionate impact. 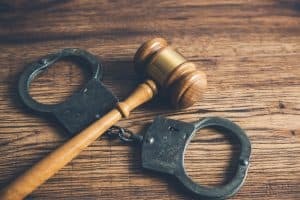 Within the criminal justice system, if police are willing or able to actually respond to your stores and arrest an offender, the case often stalls with the prosecutor’s office. 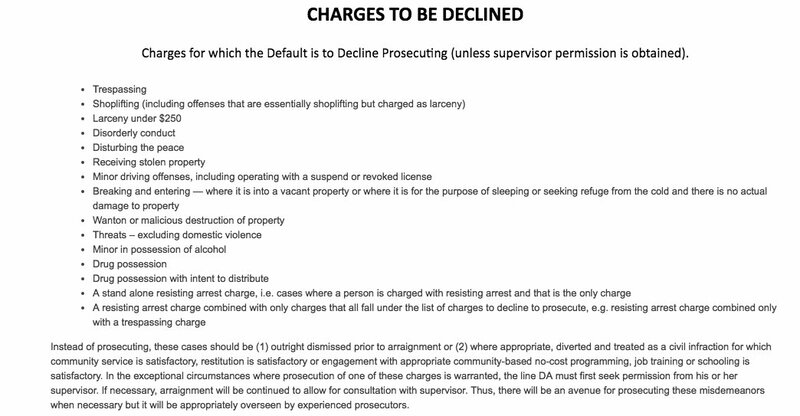 Many prosecutors—especially those in large jurisdictions—are instituting policies that include lists of charges for which the default is to decline to prosecute. Others are simply increasing the dollar value required for them to accept a theft case at all. Even when a case is prosecuted and sanctioned, the criminal justice reform movement means those sanctions are unlikely to be sufficient to deter crime and thus reduce recidivism—which, ironically, is a primary imperative of the criminal justice system. 39 states and the District of Columbia have increased their felony levels since 2000; nine states have done so twice. In Florida, one of the last holdouts, legislation to raise the threshold from $300 to $1,500 died without a vote in March 2018. 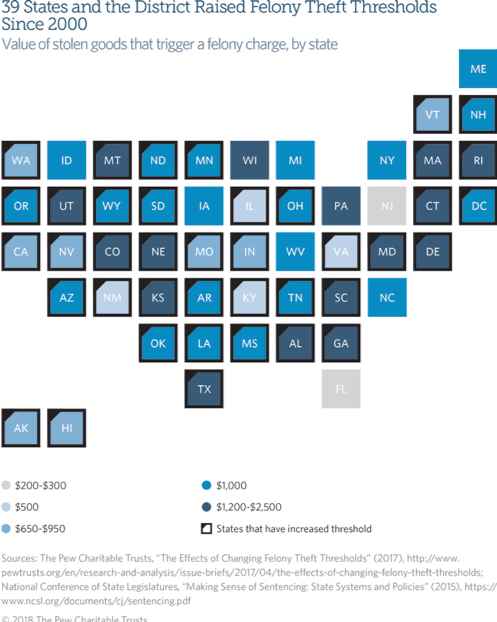 New Jersey is the only state lower than Florida at $200. However, with the publication of the Pew Charitable Trusts April 2017 study concluding that states can “safely” raise felony thresholds, the trend will likely continue. The flaw in this, of course, is their conclusion that reported crime is going down. They fail to address unreported crime: crime which can no longer be reported because of the increased thresholds. The crime has not gone away—only the report of said crime. Beyond the felony thresholds, it is crucial to recognize and fully understand what is happening to offender sanctions within the criminal justice system. Fortunately, the National Association for Shoplifting Prevention (NASP) has a window into criminal justice policies and procedures regarding shoplifting and retail theft. Its traditional focus in providing outsourced education and offender administration services to the criminal justice system gives NASP, and by extension the retail loss prevention industry, a firsthand look at criminal justice trends, as well as hands-on involvement with the current trends away from substantive sanctions and the promise of effectively preventing future offenses. Eliminating educational sanctions that change behavior and thus prevent repeat offenses, especially for juvenile offenders, does not bode well for the retail victims, the future of the retail workforce or for the offenders themselves. Massachusetts: The state has raised the age of delinquency. Juveniles under 12 are no longer charged with most offenses. Twelve- to seventeen-year olds get a free pass on the first misdemeanor offense. New Jersey: All first-time juvenile offenders now receive Station House Adjustment (diversion) at the police level. The decision to sanction or educate offenders is entirely up to each individual police department, as there are no standards for sanctioning. Texas: Theft under $100 is a class C misdemeanor, to which many police departments will not respond. In cases that are prosecuted, offenders have the option to plead guilty and pay a fine online or enter a not guilty plea and appear in court. An alarming number of offenders choose to pay the online fine, thus avoiding other sanctions. The National Council of Juvenile and Family Court Judges has passed a resolution to work toward removing all court costs and fees for juveniles, which will quickly lead to the abandoning of substantive programs to help reduce recidivism. There is a growing reluctance among judges and probation officers to impose any sanctions if there is knowledge of a retail complainant using civil demand. The justification is not to add the burden of an additional program fee on top of the court’s required fines and the retailers civil demand. Suffolk County Prosecutor, Boston, MA: The first three offenses in this list are offenses directly affecting retailers. The list even takes the time to call out and close a charging loophole on shoplifting, further expanding the scope of the list. Take the time to read the paragraph below the list. It is eye opening. Philadelphia, PA: In a policy memo from February 2018—part of the DA’s new directives—prosecutors were instructed to handle any retail theft with a value of less than $500 with a citation, the lowest possible offense under Pennsylvania law. This action carves out another threshold altogether—a misdemeanor threshold—making theft under $500 a summary offense. While summary offenses carry penalties under Pennsylvania law, NASP has learned that it is commonplace to dismiss summary offenses with little to no sanctions. The full memo can be found at this link. While criminal justice policies and strategies typically change over time, NASP’s experience tells us these trends and the resulting consequences are long term. NASP continues to address these policy changes jurisdiction by jurisdiction, but it is clear that retailers can no longer rely solely on criminal justice to impose proven effective sanctions aimed at reducing repeat offenses for shoplifting offenders. Coupled with increasing felony thresholds across the nation, what IS a retailer to do? Ironically, the answer comes from the offenders themselves, who, year after year, say that in spite of all the innovation and technology tools designed to deter them, the most important factor in their decision to shoplift again is their experience the time before. Thus, the focus needs to be on ensuring that once apprehended, the offender’s experience changes criminal behavior rather than empowering it. With a small yet galvanizing shift in thinking about the extent of the retail role in preventing repeat offenses, retailers CAN do many things, and they can start now. First, begin to break down the silos that have long defined the traditional roles of retailers and their criminal justice partners when dealing with misdemeanor shoplifting. Use your voice as the victim of retail crime to prompt collaboration. Use your common interests to find common ground. Do not hesitate to reach out and involve NASP in the process. We can and will help! Tell us where you have “problem” communities. NASP has not only a window into criminal justice, it has an open door. Its 30 years of navigating jurisdictions and educating shoplifters has honed its skills as liaison, facilitator, mediator, and problem solvers. Skills, which readily translate to benefit retailers and communities alike. Here are just a few places to start that will engender police and criminal justice collaboration and build brand image via community support and social responsibility. Actively use victim impact statements to request that criminal justice include offense-specific, evidence-based shoplifter education as part of sanctions to prevent repeat offenses. Engage NASP to create and facilitate jurisdiction-specific community action plans that ensure that educational sanctions, owned and authorized by local criminal justice authorities, are in place at all levels of the process. Use NASP and its community coordinator services to identify and capitalize on common interests as well as bridge gaps between retail, law enforcement and criminal justice in problematic communities. Why Does It Feel Good to Shoplift?